Hello everybody! It's time for a new challenge at Magnolia-licious blog. This time we have an AG theme with option of Valentines. I decided to stick with "anything goes" theme and created this CAS card. 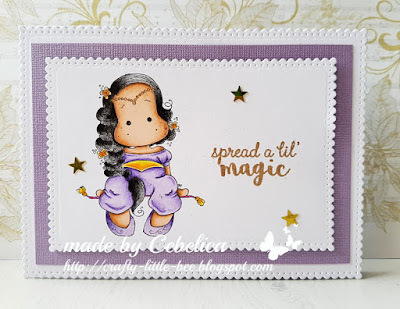 The image I used on my card is Aladdin Tilda with lamp and you can find it at Magnolia-licious store. I coloured it with Promarkers and pencils. Next to it I stamped a sentiment which I thought was perfect for this image and embossed it with gold embossing powder. Then I just added some small stars around and my card was done. Beautiful CAS card with a wonderful choice of colors! Thank you for joining us this month at One Crazy Stamper and good luck in the challenge. Magična. Kot iz 1001 noči.